Your next great adventure is 50-inches wide and as far as you're willing to go. 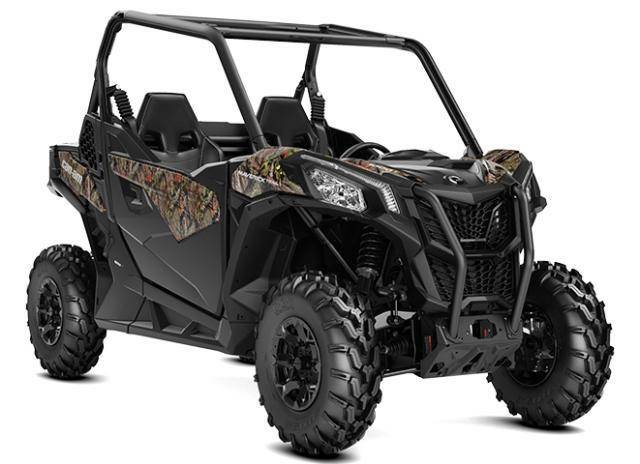 It's Can-Am engineering tuned to give the most comfortable, agile, and adaptable side-by-side ever—Where will you take the Maverick Trail DPS? In other words, a travel-sized stance without travel-sized compromises. We demanded from engineers what you do: the capability to journey wherever your heart leads, and all-day seat, cockpit, and controls that lead you out of your comfort zone. 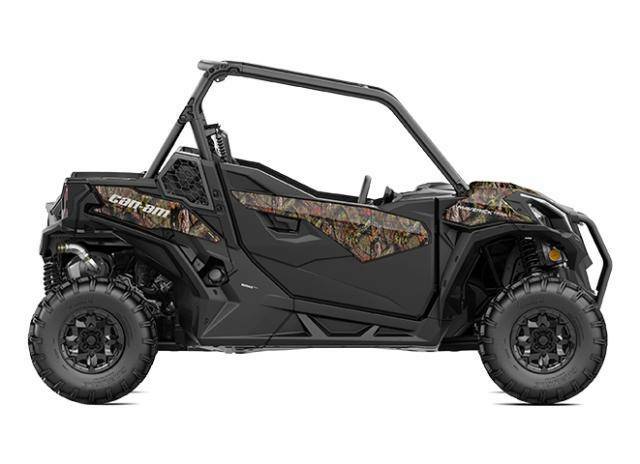 It's time to meet the first-ever Can-Am Off-Road vehicle that's been engineered into a compact 50-inch space: the Maverick Trail DPS. At your choice of 51 and 75 horsepower, the Rotax heart in every Maverick Trail beats to a battle-honed drum. We couldn't begin to list the adventures, racing wins, or acheivements the 800- or-1000-cc V-twins have earned, which is in part why you're dreaming up where these torquey powerplants could take you. Known for its innovative and feedback-rich Dynamic Power Steering, the Maverick Trail offers easy steering assistance to the rider, adapting to the vehicle's speed. At walking speeds, assistance is increased to reduce steering effort, while at higher speeds, it is reduced to keep maximum steering feel to the rider. In the decades we've been building recreational vehicles, we've overcome it all, and can't stress how well this combination of our new Quick Response System (QRS) CVT transmission and Selectable 2WD / 4WD with lockable rear differential combine to meet your plans head-on. Now with high airflow ventilation and Electronic Drive Belt Protection, the CVT can apply Rotax torque over tricky terrain well into the night. With its Rotax engine, Can-Am powertrain, Ergol-Lok cockpit, and advanced suspension setup, the driver is meant to feel like we've got his back while navigating through a chosen route. Adjustable tilt steering, a thick-rimmed wheel, and a comprehensive multifunction digital gauge display are all you'll need to carry on—with Electronic Hill Descent Control when you need it. Designed for trail riding, the double A-arm front suspension and TTA rear suspension combine to offer up to 10" front and 10.5" rear travel. This isn't a shrunk-down Maverick X3 or up-sized Outlander, it's a trail-sized journeyman. With its two occupants at its centre, the complete Ergo-Lok cockpit was shaped to carve out never-before-seen occupant space while retaining the ability to squeeze down narrow paths and through tight trails. Ten. That's how many LinQ attachment points are built into the Maverick Trail. It may seem like overkill, but we know what this UTV is capable of—and that you'll want to use every inch of it. Choose from BRP-designed and engineered, gear bags, gear mounts, gun racks—more than 100 in all. In addition, all models come complete fitted with an accessory-ready 650-W magneto to handle additional electronics or Heavy Duty applications. With little space to work with, every line on the Maverick Trail has a purpose. Its styling and function are inseperable, a block of signature Can-Am DNA carved into a 50-inch-wide canvas. From its 55-W headlights to LED tail lights, integrated roll cage to 300-lb (136-kg)-capable cargo box, no detail has been hidden from view—leaving only the essential, best features at your command. The skid plate ads never tell you that being "tough" doesn't cut it when you're miles from the nearest cell tower. You want a vehicle that's mechanically robust, overbuilt, well-engineered—and then braced for battle. From its steel cage to integrated front steel bumper and injected full skid plates, the Maverick Trail is dressed and armoured to suit. With over 100 accessories available for the Maverick Trail you can truly have your adventures your way. In addition, all models come complete fitted with an accessory-ready 650-W magneto to handle additional electronics or Heavy Duty applications. Guaranteed to fit right, look great and last on the trails, there are countless ways to customize your Maverick Trail.